Rachel Hamilton is currently attending the ADHD rewired accountability group with Eric Tivers and 11 other people. We are fortunate she was able to take time to be with us this week to share her story. Rachel was diagnosed with ADHD not long ago. She was at the Burning Man event when a friend of hers offered her a Ritalin. 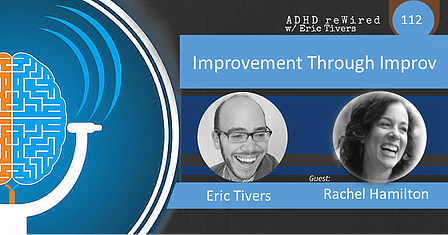 Rachel is now aware of the repercussions of taking ADHD meds recreationally, but nevertheless she did indulge years ago, and it had a profound effect on her. After taking a Ritalin she felt organized and together. Things just felt right and she had an unfamiliar awareness she had never before experienced. This made Her curious and she began to learn more about ADHD through the reading of books and articles. – Shownotes written by Tom Nardone. Travels teaching customized workshops to a wide variety of clients looking to expand themselves or their businesses through Improv. Rachel earned her chops as part of the cast of Second City, Chicago, tearing it up with the likes of Ms. Tina Fey, Ms. Amy Poehler, Ms. Rachel Dratch, and other assorted comedic geniuses. She got hooked on improv early and has been dedicated to exploring and experimenting with this magical art form ever since. These days, she teaches Improv in order to share the heart-opening, juicy life- inducing effects with the world beyond performance. She love teaching Improv to anyone looking to be a more happy, courageous, connected, fully-expressed human being who is looking to add more having fun to their lives. Yeah, little ol’ Improv just might save the world. Superpowers: creating custom-designed workshops that use Improv guidelines to achieve specific outcomes, ie: Improv Skills for Kickass, Improv Courage Academy, Combatting Shyness, etc. Born in DC, Rachel has lived, loved and worked in all the major cities; Chicago, LA and most recently NYC. Last year, in a conscious quest for more tranquility and natural beauty, Rachel made the brilliant choice to move her base to Sausalito, California and is delighted to be bringing her deep well of experience to the Bay Area’s vibrant Improv scene.